Our J2 and J3 teams competed in Xtreme Spirit Midwest National Championship in Wisconsin Dells on March 20-21. CONGRATULATIONS! on some great performances. What a way to end the season! Our teams competed in the GLCC Chicagoland Nationals on March 7th at UIC. * Jr 2 - GLCC National Champs 1st out of 9 and two specialty awards...what an awesome performance! Thank you parents and fans for your amazing support. Our J3 team competed in the Cheersport Chicago Grand Championship on February 28th at UIC Pavillion, finishing in 2nd place. Way to hang in there Kesheyla after getting hurt in warm-up. Great job to the team and to Cassidy and McKenzie on filling in. 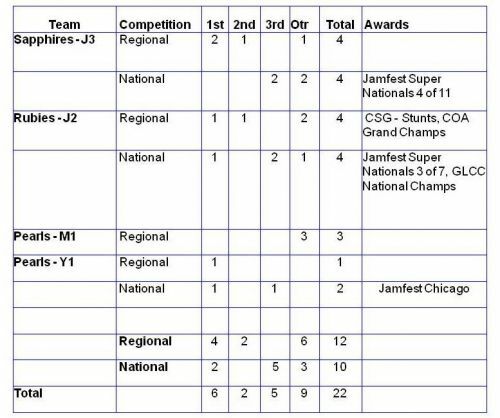 Our teams competed in the Jamfest Chicago Nationals on February 20-21 at Navy Pier. Great job by all the teams. Youth 1 you sure have come a long way. Your hard work and that of your coaches has surely paid off! Thank you parents family and friends for your support. It was great to see some many fans from the past and our long history. * Youth 1 - National Champions! Our J2 - Rubies and J3 - Sapphires competed at Jamfest Super Nationals on January 16 and 17 in Indianapolis IN. There were close to 500 teams participating. We are so proud of the team's performances both days and moving up in placement day 2. Thank You parents, family and friends for your oustanding support cheering the teams on. * J2 Rubies 3rd of 8 ...Yea top 3! Our teams competed in the COA Windy City Championship on Sunday January 10, 2010 at UIC in Chicago and we finished with a clean sweep with all teams finishing FIRST. * Pearls - 1st place with a 7.21 in their first competition in the youth division. * Rubies - 1st place with a 7.66 and level 2 grand champs. * Sapphires - 1st place with an 8.04. Awesome performance by all teams and continued improvement! Parents, family, and friends your fan support was unmatched....THANK YOU! * Pearls great job! You continue to get better every competition. * Rubies great progress today, finishing second and getting Champion Stunt award. * Sapphires - 1st Place and outscoring everyone performing in your session. Great job to all our teams. If any one has photos please e-mail them to us. Our Pearls and Rubies competed in Jamfest LIVE! on Saturday November 21st. Sapphires get well soon! We are proud of your performances! Pearls what a great improvement! Next Competition... CSG Holiday Classic December 6th. If anyone has photos please email them to usallstars@aol.com. Visit our Youtube Channel for videos.